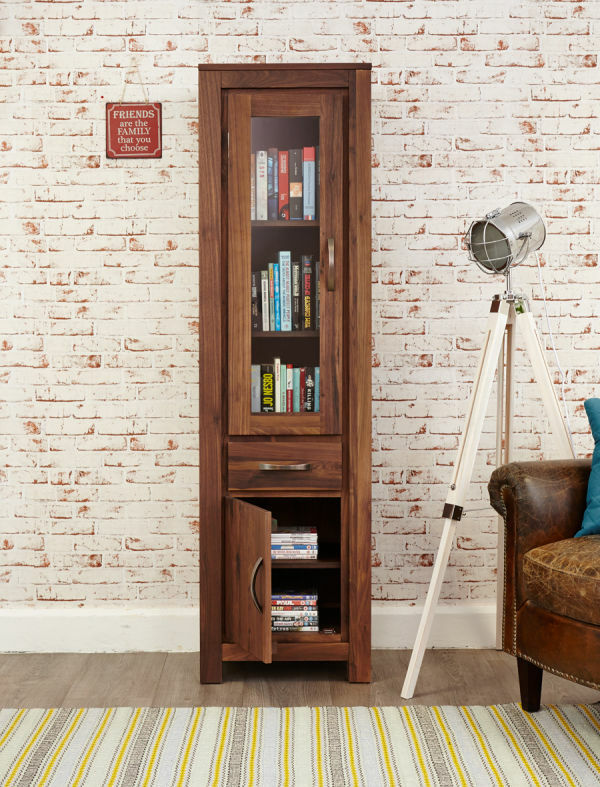 Our stunning range of wooden display cabinets are the perfect way to show off treasured possessions - ideal to keep collections of ornaments, books and cherished family photographs dust free and secure. The Wooden Furniture Store have a wide range of display cabinets to complement every style of interior from modern to a more traditional looks. Elegant and practical, our ranges feature space saving pieces in various shapes and sizes from dresser tops to narrow glazed units. Oak display cabinets for the living room can add instant style but they can also be a beautiful addition to a dining room or hallway. Many of our display cabinets are part of large living and dining room collections that include coffee tables, bookcases plus dining tables and chairs. Display cabinets are a versatile addition to any home. Whether you need an oak corner display cabinet with glass doors to house your collectables, a corner unit to maximise every inch of space or a dramatic freestanding unit, we have the perfect solution. 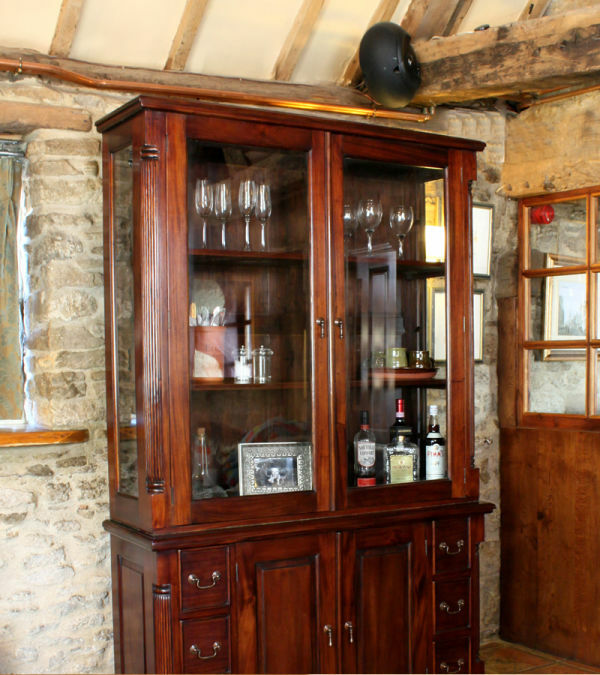 We offer table tops and hutches that you can added to sideboards to make display cabinets that can breath new life into a dining room, as well as providing value space to show off treasured items. 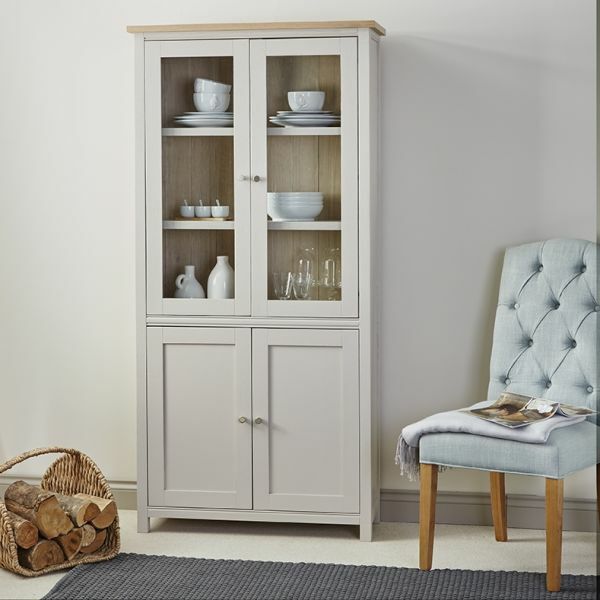 Choose from styles with plenty of shelves for glassware and crockery and for extra storage, some display cabinets come with cupboards integrated into the bottom of the unit. All of our display cabinet features thick solid wood shelves to prevent bending or bowing over time, keeping your treasures safe and they also have a solid back, so the cabinet looks beautiful from every angle. 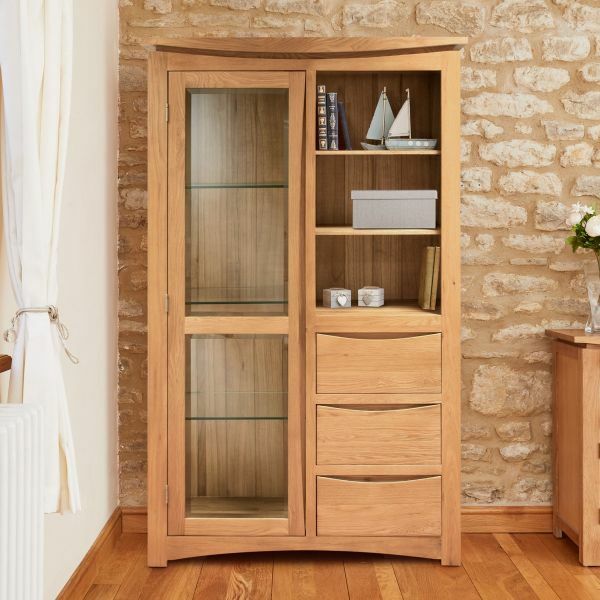 For added features, style and practicality a solid oak display cabinet with built in lights and sliding doors is a perfect addition to any dining or living space. Whether you are looking to buy a cabinet for storing crockery in your kitchen, a glass display cabinet for showing off photographs and ornaments, or a small display cabinet for a few prized possessions, it's always important to get the size of your cabinet right. Think about where you're going to place it, how much you intend to display and remember to measure your available space. It's a good idea to keep display cabinets away from strong sunlight to protect it from fading and not to place it near a radiator. Show off your home's treasures in style and hide away the clutter with our beautiful range of display cabinets. The Wooden Furniture Store have a selection of wooden and glass display cabinets to suit any taste from rustic to more contemporary. Solid oak display cabinets are timeless and fit in with most decor schemes, they can also be used to create contrast when mixed with other wood types. 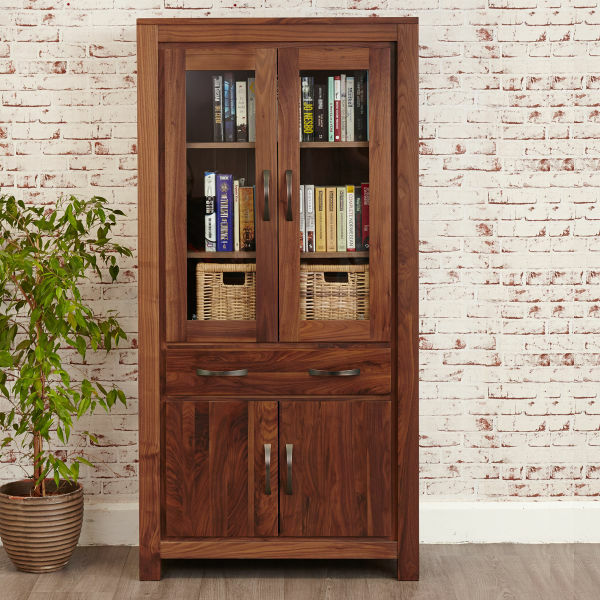 Choose from our selection of walnut display cabinets which benefit from the woods natural strength and rich textured grain pattern. Glass display cabinets blend in seamlessly with any interior style and offer a contemporary look. Or choose modern country elegance with a sophisticated painted frame display cabinet - ideal for showing off your best china and glasses. Our beautifully made display cabinets will make a lovely focal point in a living room, dining room or hallway. And don't forget that any of our oak dining table and chairs will compliment your choice of cabinet perfectly. Our display cabinets are made from solid wood and treated with a hard wearing lacquer finish to enhance the timber grain and protect against everyday wear and tear. All cabinets have dovetail drawer joints and are finished with elegant fittings to ensure that they look perfect - as good as the day they were purchased - in years to come. Orders to most postcodes are delivered free and all display cabinets arrive fully assembled, direct to your door delivered by our considerate logistics teams. Many ranges from the Wooden Furniture Store are protected with a 5 year guarantee so you can sit back and relax safe in the knowledge your new furniture will still look good in years to come. 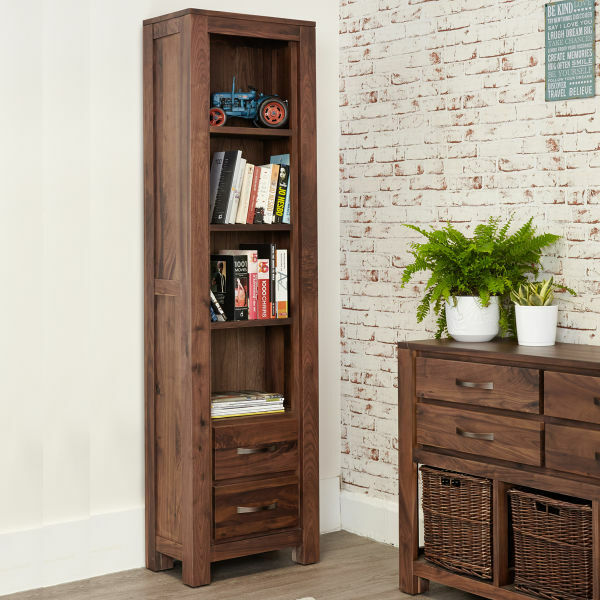 Every home has items that deserve to be displayed and we're sure you'll find the perfect cabinet for your at The Wooden Furniture Store.